We hope everyone is ready for STRETCH TUESDAY. We are Russell and Kitty Umbraco and today is our first time on the mailing list. Everyone asks why we started collecting carnival and stretch glass. In the mid 1960’s while attending the University of Nevada in Reno, Russell heard about gold coins being dug in the Virginia City Dump. He madly rushed to Virginia City to find gold coins, but found some old dirty bottles. Later when we were dating, he gave me a flower in an old aqua bottle that had a pretty natural iridescence. The bottle looked dirty so I washed it. The iridescence went down the drain!!! Mother Natures’ iridescence is very fragile as chemicals in the soil eat away the finish of the glass. A few years later, bottles were found in Benicia, CA. At low tide they were digging in the Bay mud. 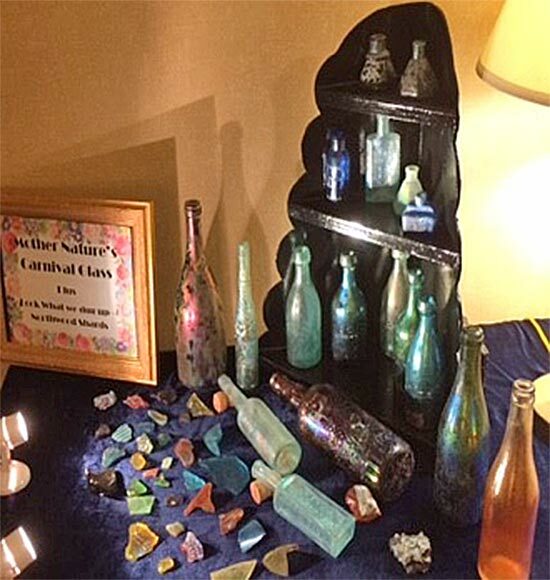 Because there had been a tannery and other businesses that dumped their chemicals in the Bay in the 1800’s (yes they had pollution in the 1800’s), many of the bottles had a beautiful iridescence on the outside of the bottles. They are highly collectible today. One day while at the flea market, we spotted a plain rolled rim celeste blue (stretch glass) iridescent bowl which we purchased because it was pretty. Friends and antique dealers identified the bowl as Tiffany, Steuben, carnival glass, etc. So we did research on the bowl. 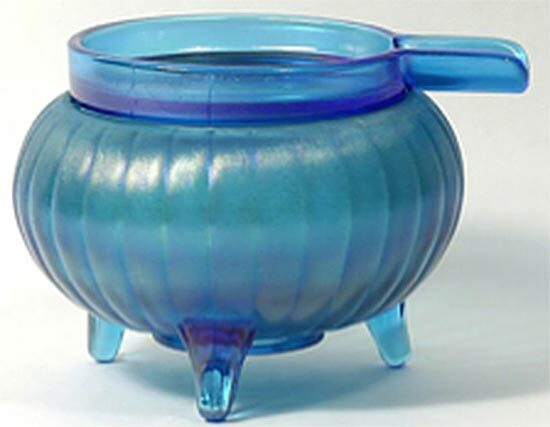 When compared to art glass like Tiffany, we realized the blue bowl wasn’t art glass! It didn’t really look like carnival glass either. In doing the research (no computers in those days), we found a copy of Larry Freeman’s book “Iridescent Glass”. According to Mr. Freeman, around 1858 the Lobmyer Brothers were having a celebration in their Hungarian glass factory and by accident some of the fireworks went into the ovens. When the glass came out of the ovens, some of the glass had a beautiful iridescence. They played around with the chemicals used in the fireworks and made modern iridescent glass. Christine do you ever think of this “lucky” accident when you are working with the fireworks and your carnival glass? In the 1960’s, Stretch Glass was called: “onion skin”, “Tiffany “– “Poor Man’s Tiffany”, “Aurora”, “Imperial Jewels”, “Stretch Glass”, etc. 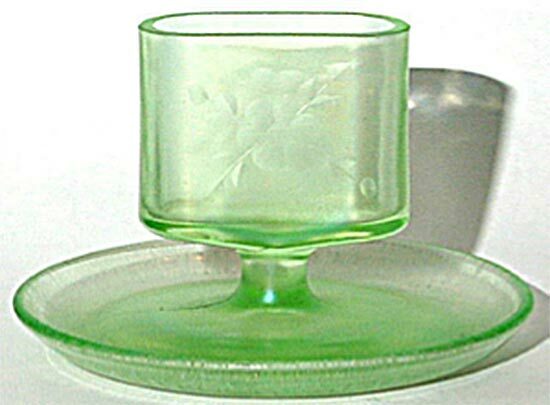 Most of the company names only described their line of “Stretch Glass” so the most descriptive name and the name that most glass collectors used was Stretch Glass. Stretch Glass is a “cousin” of carnival glass. It starts out like a piece of carnival glass. 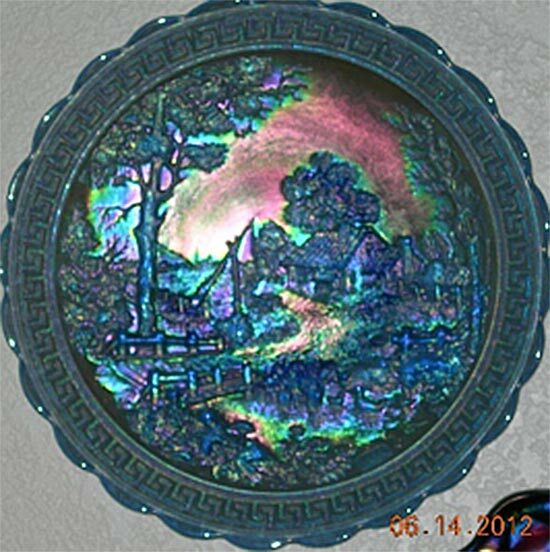 The following steps are greatly simplified in making pressed, iridescent glass: carnival and stretch glass are pressed molded glass that that have been shaped into a plate, bowl, vase, etc. Then the piece is sprayed with special chemicals which will adhere to the surface to produce the iridescent finish. For Stretch Glass, after it is sprayed, the piece is put back in the ovens. This step will make the iridescent finish contract to make the “stretch” finish. The reheating of the glass has a tendency to melt heavily patterned pieces if they are not carefully watched. This is one reason why most stretch glass has a simple or no pattern. The Homestead plate on the left shows how the reheating of the plate melts the pattern. The blue plate on the right has sharp details. The smoke Homestead plate has a stretch finish; whereas the blue Homestead plate has a ‘smooth carnival’ finish. The Stretch Tuesday topic for today is smoking pieces. Smoking was prevalent in the “Roaring Twenties”. In the 1920’s, they had a dish for everything (sometimes we wonder how big their dining tables must have been to hold all of the dishes?). The first picture at the top of article shows a match holder on the right which is carnival glass; can’t find the manufacture’s identity in our research materials, but the base is like several Dugan/Diamond pieces and the dark color is similar Diamond’s Egyptian Luster. The green match holder on the left is made by Diamond. The second picture (below) is an Fenton #556 cigarette holder with an oval top; the third picture is a Fenton #554 cigarette holder with a round top; the fourth picture is a Fenton piece #655 a cigarette box – the removable lid is fragile and has a wheel cutting “flower” in the center and etched “K(reversed) KK” around the edge. The 3 Fenton pieces come in a variety of Fenton colors except for red and cobalt blue. 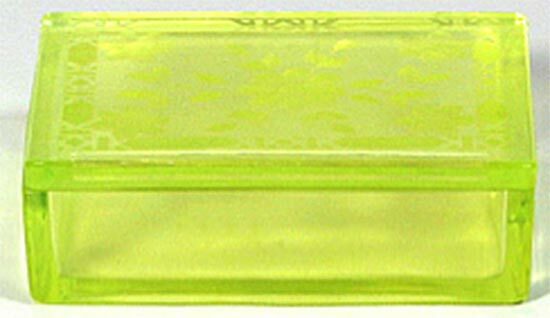 Picture #5 is an ashtray also by Fenton and is quite easy to find in celeste blue and topaz (yellow) some have the metal band and others are plain. 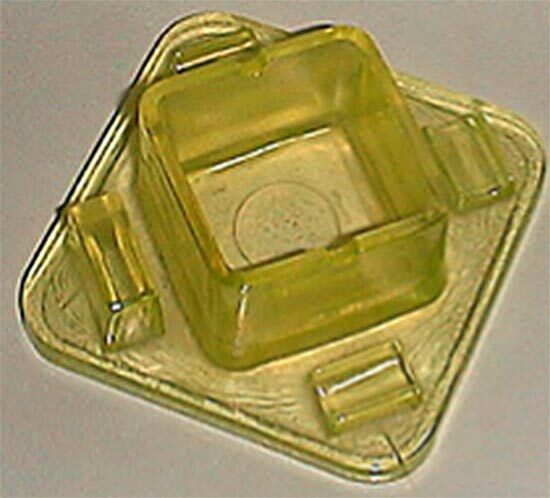 The individual small glass ash trays are in a gradual range of sizes so they stack in the ashtray. They have been found in topaz, celeste blue, Persian pearl (white) and Florentine green. These cigarette dishes would have been sitting in the living room and on bridge tables so they were handy when someone wanted a “smoke”. Has anyone seen any other colors? 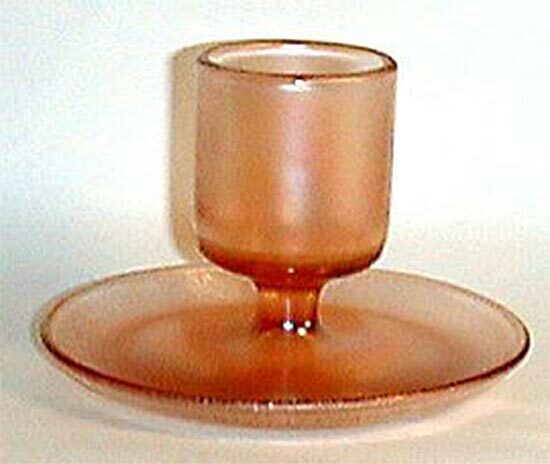 The topaz piece, #5, is by US glass. The pack of cigarettes would fit in the center with cigarette holders on the side. We have never seen this piece before. Would consider it rare but “rare” isn’t always desirable nor expensive. The last piece is by Northwood. The footed bowl with an ashtray on top is Northwood. 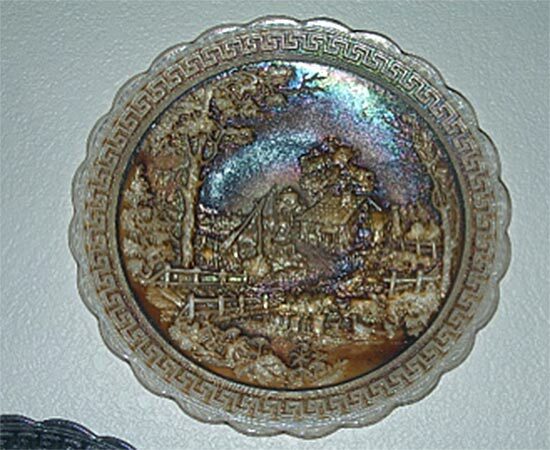 The cigarette ashtray is similar to the one made by Fenton. The glass companies copied each other which makes identifying which company made a piece of glass interesting at times. After many years of people smoking, we certainly know that smoking is very bad for your health. The six photos below were taken by Dave Shelter- thanks Dave.